When Richelieu took power as Chief Minister, he had inherited a state in turmoil. His campaign in favor of the Swiss Protestants and opposition to Catholic Spain and Rome, enraged the citizens and the Church. The Huguenots, dissatisfied with the Treaty of Montpellier, broke into rebellion. That treaty required them, in exchange for religious toleration, to destroy their fortifications and to cease all assemblies other than religious. The only “places des surite” left to them were La Rochelle and Montauban. 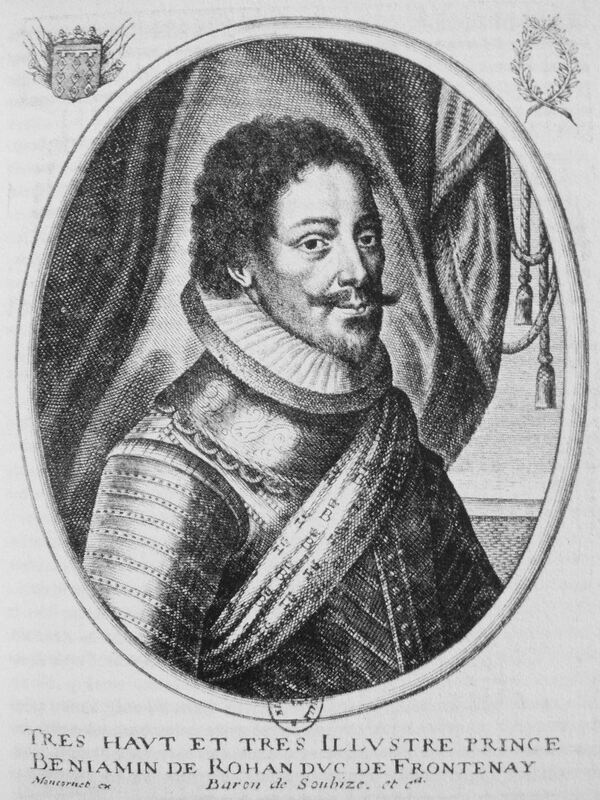 The Duc de Rohan, their leader was deprived of his provincial governments and Fort Louis had not been torn down at the harbor entrance as promised. Henri and Benjamin Rohan, labeled by Richelieu as “les freres antichristi”, were the only remaining Protestant leaders of the Huguenot party. Benjamin, the more aggressive of the two, had seized the Isles of Re and Orleron and escaped with three ships which were in the harbor. Benjamin did have a reputation for piracy. The money that had provided the ships had come from Spain. He then moved up the coast to Brittany where there were now 6 French battleships in Port St. Louis. Five had been borrowed from the Duc de Nevers, including the great battleship the Vierge, with it’s eighty guns. Benjamin, (known as Soubise) after taking the town and castle, left with four of the borrowed ships. From Oleron, he terrorized the merchant ships coming in and then joined his brother who had already set Languedoc ablaze. Richelieu’s diplomacy gained him support from England and Holland who both sent ships to his aide. These combined with a small fleet of French ships, won back Re and Oleron and dispersed Soubise’s ships. Here Richelieu held his hand because there was a wedding to plan that would ally England to France when Henriette Marie, Louis’ younger sister, would marry Charles I of England. This entry was posted in Cardinal Richelieu, French History, Louis XIII and tagged Cardinal Richelieu, French History, Louis XIII by Shamwest. Bookmark the permalink.